The Rascal Target XP comes with a host of “grown-up” features, along with an Aim Sports 4X scope factory mounted and zeroed. With one eye on our youth and the other on the future, Savage has updated and refined the ol’ single-shot Rascal into two very fetching target models — one without a scope, the other complete with a factory-mounted 4X. Heading for the range with the scoped Rascal Target XP in tow is enough to put a little jig in anyone’s stride. Ah, to be young again! Ensuring the future of shooting sports by actively recruiting youth is a goal of the utmost importance. Mentoring young men and women is the future of the shooting sports. While it’s often hard to pry them away from their computers and iPhones, the appearance of specialized, youth-sized firearms like the Savage Rascal Target make the job of getting our kids out to the ranges and fields a lot easier. American gun companies have been coming up with new models of rifles and shotguns every year proportioned to youth or smaller stature adults. This is a vital trend — to suitably outfit our children so they’ll hopefully uphold their sporting heritage as they grow into adulthood. What’s particularly catchy about the scoped Rascal Target XP model is it’s “techie,” at least enough to seize the attention of our screen-fixated, technologically savvy youth. With an adjustable weight of 2.5-6 lbs., the AccuTrigger is also one of the world’s safest, thanks to the AccuRelease. Adding a husky, no-nonsense bolt knob on a beginner’s target rifle makes a lot of sense. The Rascal Target comes from the factory with a suppressor-ready threaded muzzle. 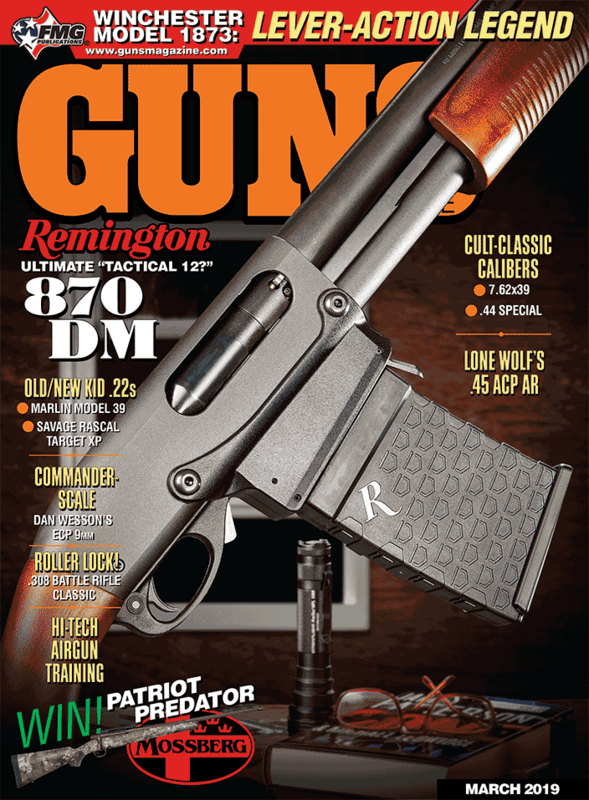 Imagine telling a young shooter their gun is ready to mount a snuffer … instant cool! So, what’s “techie” about the Rascal Target XP? Several things: one-piece Picatinny rail, AccuTrigger, scope and a muzzle threaded 1/2-28. Add in a 300-round box of CCI’s red, white and blue-coated Patriot .22 LR ammo and, well, you pretty much get the idea. The rapid transition of the Picatinny rail from the AR family to bolt-action sporters has been a blessing. Providing an extended, one-piece base formed with multiple mounting slots, the Picatinny has simplified the mounting of a variety of optics ranging from red dots to target scopes. As a universal-type base, the shooter has only to select a set of suitable scope rings, or in the case of a red dot optic, a Picatinny compatible model. It’s a solid mounting platform providing easy-to-adjust eye relief. Savage’s owner-adjustable AccuTrigger is a marvel of simplicity and security. It’s the perfect trigger for youthful pupils and can be adjusted from 2.5 to 6 lbs. 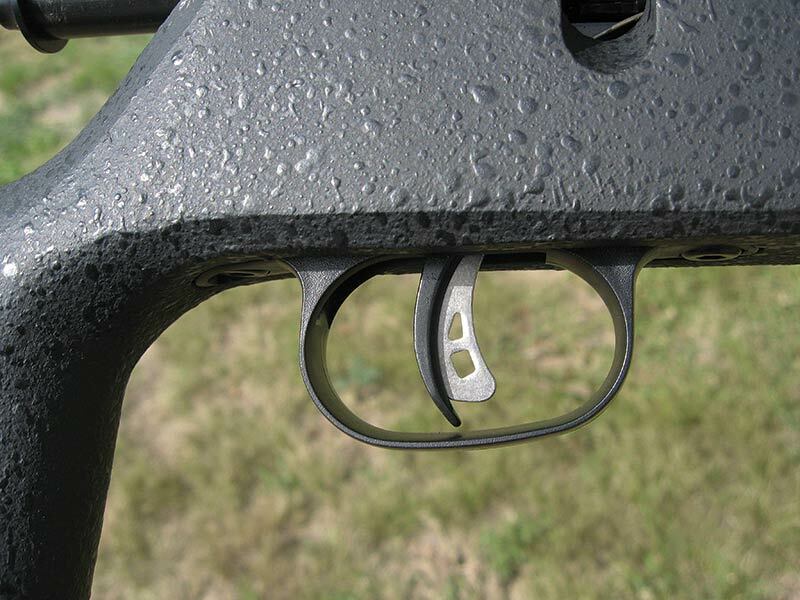 The secret to the AccuTrigger is the central lever called the AccuRelease. The AccuTrigger is set up at the factory with a minimum of sear engagement. If the rifle were jarred or dropped, the sear could easily be tripped and the rifle accidentally fired but this is where the AccuRelease comes into play. Unless the AccuRelease is fully depressed — as it would be when the trigger is pressed — it firmly blocks the sear. Yup, it’s “techie” alright. The factory mounted and bore-sighted Aim Sports, 4x32mm scope is a terrific upgrade on a learner’s rifle, elevating it to a whole different level of performance. Our kids live in a highly visual culture and optics naturally appeal to them. Optic-mounted firearms are what they see on YouTube, TV and at the movies. They expect it! There were two things I really liked about the scope. It was well zeroed out of the box and put me dead on at 25 yards. Can you imagine a learner struggling to zero a scoped rifle for the first time? It would be a disaster. The other neat quality of the scope is the reticle is set up as a ballistic-plex, featuring six aiming points along each horizontal and vertical axis, providing windage and range holdover. Just zero it in at 25 yards and range out to 100 using the aiming points. “Techie” again! Rounding out the youth-appeal coolness of the Rascal Target is its 1/2-28 threaded muzzle, just screaming for a silencer. Our youth need to learn to appreciate the value of ear protection (Savage includes a set of ear plugs) but suppose you handed a beginner the Rascal Target sporting a suppressor at the muzzle. Talk about the Sounds of Silence! Can you imagine the effect on our shooter, rolling tin cans with no noise except the “dink” of firing pin hitting primer? The Cool Factor strikes again! As a final bonus, you arrive at the range and you hand your first-timer a box of CCI’s colorfully “patriotic” ammo — a real salute to Old Glory! It’s a shooter! The Rascal Target proved exceedingly accurate and when you add the host of standard features, it’s a great choice for kids learning to shoot. CCI’s patriotic Old Glory ammo proved to be the most accurate ammunition in Holt’s testing. So, let’s forget about youth appeal for a second and address the all-important question: Did the Rascal Target XP shoot? You bet! At 50 yards the setup proved sensational with CCI’s standard velocity stuff but their Patriot load turned in the winning 0.59" group. With its 11.5" LOP, an overall length of 30.6", a scoped weight of 5.8 lbs. and availability in both RH and LH format, the Rascal Target XP is the perfect micro-scaled trainer for the shooters of tomorrow. The MSRP for the scoped version is $399.